fun Christmas gifts using Christmas yarns. I am done! Woo Hoo! But, I had several 1/2 balls or less, of Christmas yarns left over. And 2 strands of yarn. 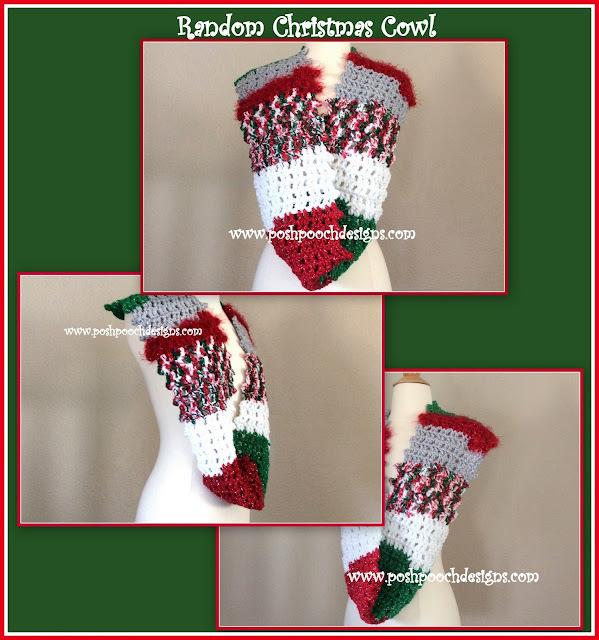 I Named this Cowl Design "Random Christmas Cowl"
But you can make it as long as want. which I think, is the perfect width. Picot Stitch (pcst) Explained in the pattern. To make sider - add in 3 ch increments. To make longer stitch as many as as needed. Cowl is worked using 2 strands of yarn. Ch 3 counts as dc at beginning of rows. Repeat Front * to * 5 more times. Or as long as you want it. rather then with my models. Christmas Sparkle to your Holiday outfit. And it is a great last minute gift! STARWARS Day! And My Princess Leia Hat.